I read this article and found it very interesting, thought it might be something for you. 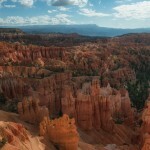 The article is called Guide to Visiting Bryce Canyon National Park in one day and is located at https://capturetheatlas.com/visit-bryce-canyon-in-one-day/. 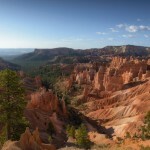 Visiting Bryce Canyon was not in the initial plan of our 10-day West Coast USA trip. After our visit, we could not help but wonder how Bryce Canyon National Park remains unknown for most people, especially outside of the US. 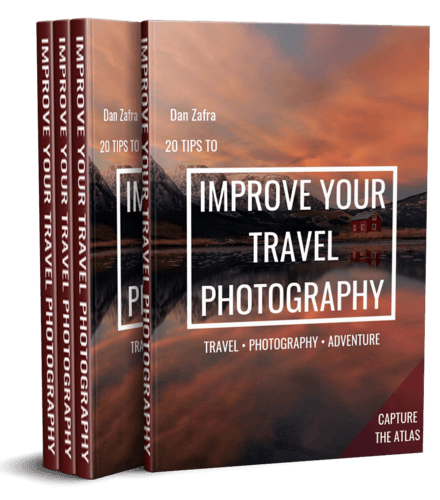 Unlike other tourist sites such as The Grand Canyon or Yosemite, we have never heard of Bryce until we started planning our West Coast America trip in depth. I dare to say it was one of the most surprising places of the whole trip. We are still trying to understand how this park is not part of the classic scenarios of the Far West, with its incredible rock formations which seem to be from another planet. 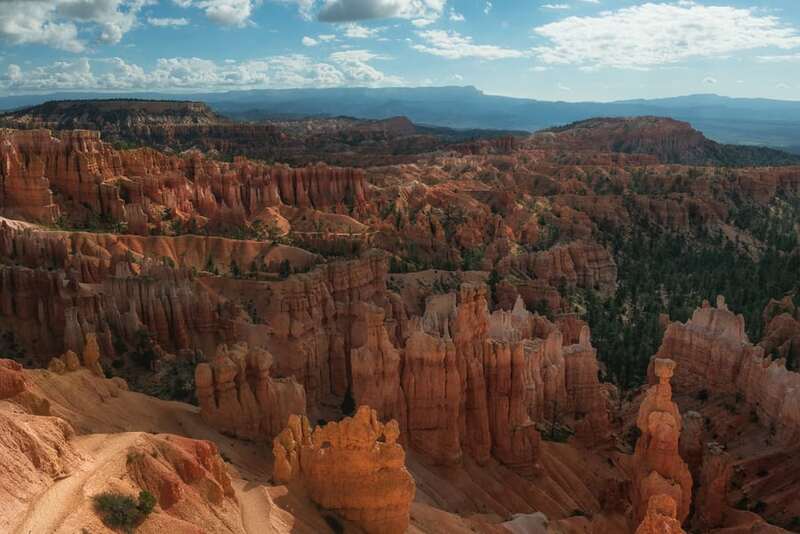 In this article, you will find a guide with the best things to see and do in Bryce Canyon, plus a lot of essential information for visiting Bryce in one day. We only spent one day in Bryce during our 10-day West Coast USA road trip. However, you will need more time if you want to hike all the trails and visit all of the different viewpoints. Although we did not have much time, we decided to include Bryce Canyon in our travel itinerary after coming across a few images of it. First, we checked the location of Bryce Canyon on a map, which is in the state of Utah and close to Antelope Canyon, a location already in our travel itinerary. We decided we would drive to Bryce to spend the day after we visit Horseshoe Bend, to discover more incredible rock formations and landscapes. Although we did not spend enough time in Bryce Canyon National Park to visit each of the most important places, even spending half a day was completely worth it. In a nutshell, these are the best things to do in Bryce in a day. 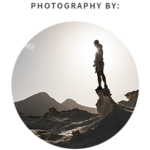 Sunrise Point: See how the sun illuminates the famous “Hoodoos” from this classic viewpoint. 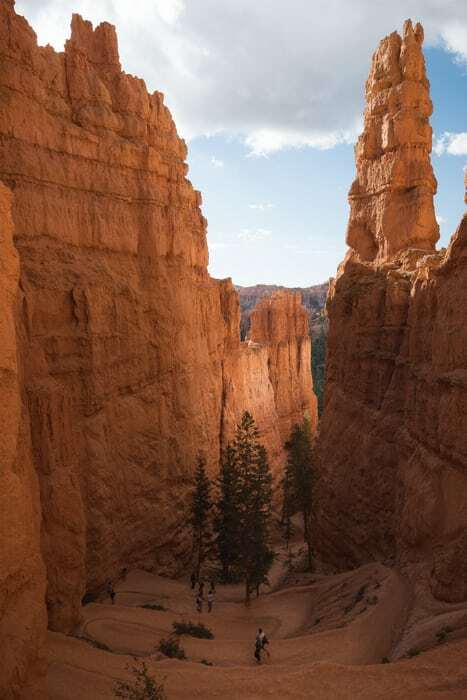 Hiking routes: Go on one of the short hikes you can do in Bryce in a day like the “Navajo Loop” or the “Queens Garden Trail”. Thors Hammer: Admire the most famous rock formation in the Park. 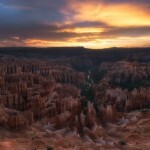 Bryce Amphitheater: See the famous amphitheater at sunset from the “Sunset Point” viewpoint. Two bridges: Visit these well-known natural karstic bridges. 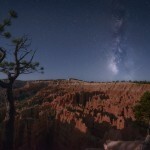 Starry Skies: See one of the best night skies in North America from any of Bryce’s viewpoints. Wall Street: Hike this winding trail and enjoy the views from above. Look for some of its most peculiar rock formations such as Queen Victoria. It is best to visit Bryce Canyon on your own by renting a car, as public transportation in the United States is not the best means of moving around. 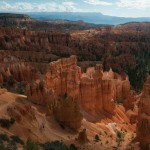 At the same time, Bryce Canyon is not touristy enough to join group tours from nearby cities. The closest international airport to Bryce Canyon is Las Vegas. However, note that there is still a 260 miles distance between Las Vegas and Bryce Canyon, so the drive will take around 4 hours until you arrive. Other points of interest on the way to Bryce include the Valley of Fire State Park and the Red Cliffs National Conservation Area. If you visit Antelope Canyon, Bryce Canyon is not too far away. Bryce is 150 miles from Page so you can even enjoy the sunset at Horseshoe Bend first, then drive two and a half hours to Bryce, spend the night, and visit the park the next morning as we did. 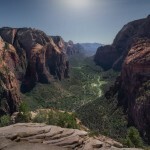 Normally, people visit Bryce and Zion National Parks together since they are only 62 miles apart. Although it is recommended to spend a day in Bryce and at least one day in Zion, you can visit Bryce and Zion in one day, hiking one trail in each of the parks. 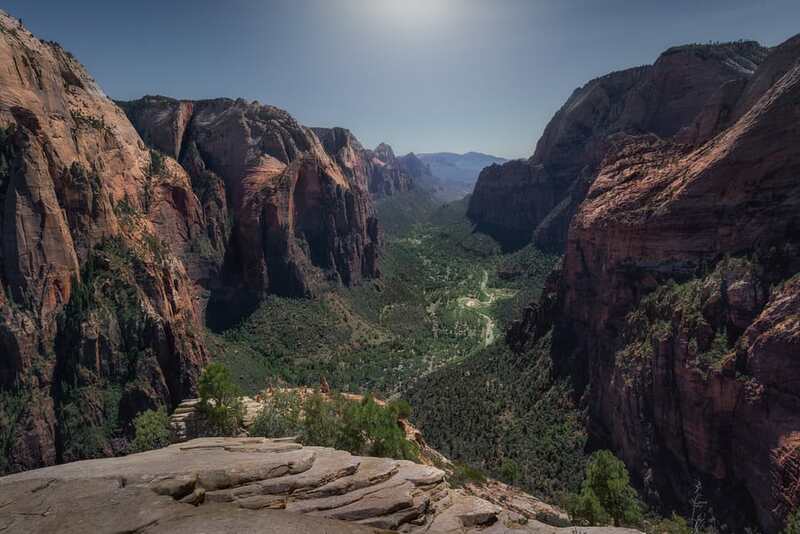 It takes about an hour and a half to get from Bryce to Zion, but keep in mind that the only way to get inside Zion National Park is by parking in Springdale and taking a free shuttle that runs through the trails within the national park. There is a 280 miles distance between Bryce and Grand Canyon Village (the most touristy part of the Grand Canyon southern rim), which would take about 5 hours. I do not recommend visiting Bryce and the Grand Canyon on the same day as it takes a long time. However, I suggest touring through other points of interest along the way. 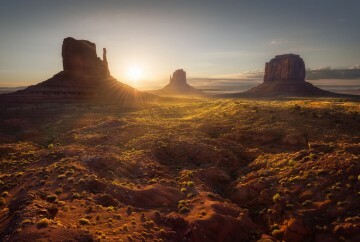 For example, you can plan an itinerary across Las Vegas, Zion, Bryce, Page (Antelope Canyon and Horseshoe Bend), Monument Valley, Grand Canyon, then back to Las Vegas. The most important thing to see in Bryce are the rock formations known as “Hoodoos”. 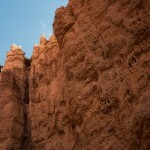 These characteristic rock formations set Bryce apart from any other landscape you’ve seen before. 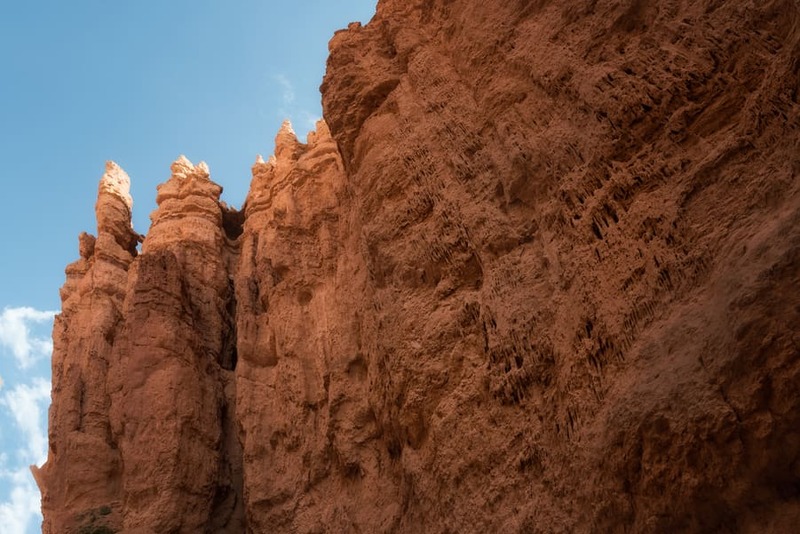 To discover these unique forms, you can take a scenic drive to enjoy the best viewpoints of Bryce or hike one of the trails that will take you from the Hoodoos to an enchanted world. We can split Bryce Canyon into two main areas: the Bryce Amphitheater, more accessible and touristy, higher concentration of Hoodoos forming an amphitheater; and the further away southern area of the Bryce Canyon, with a lesser tourist presence and a view among different scattered Hoodoos. 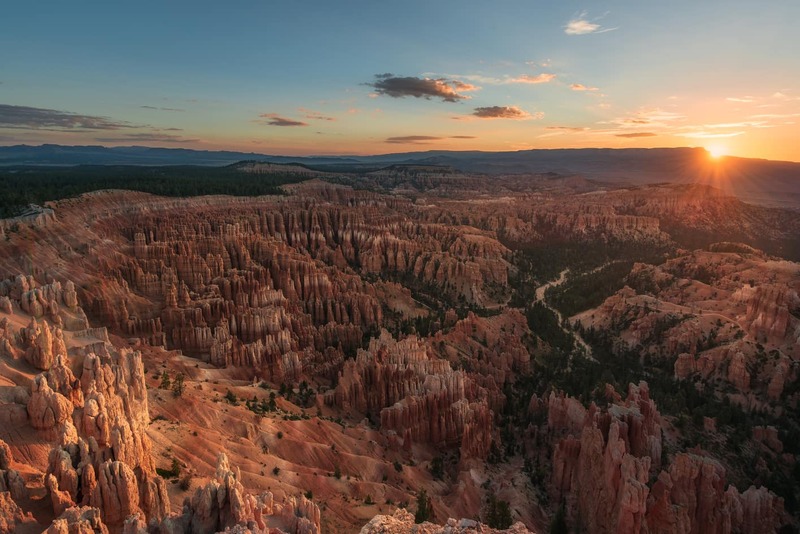 At the end of this article, you will find a detailed Bryce Canyon map with all points of interest that we will mention: Bryce lookouts, major trails, hotels in Bryce Canyon National Park, campsites, and backcountry campsites. Fairyland Point: This viewpoint is the only one located north of the Bryce Amphitheater. One of the most interesting trails starts from here. Sunrise Point: One of the main viewpoints within the Bryce Amphitheater, best for enjoying and photographing the sunrise in Bryce. Sunset Point: Very close to Sunrise Point, it may be the best viewpoint of the Bryce Amphitheater. 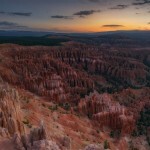 Recommended visiting both to enjoy sunrise and sunset in Bryce. 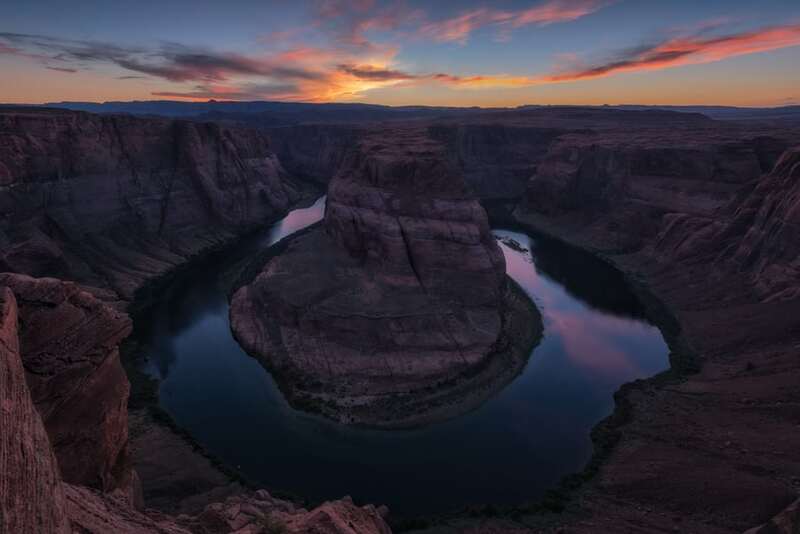 Inspiration Point: This viewpoint is also located in the amphitheater and offers amazing views, especially at dawn. For us, it was a must see in Bryce. Bryce Point: It is the last viewpoint located in the Bryce Amphitheater, offers very good views from the southern area. Paria View: From Bryce Point there is a less busy road to reach this not-so-visited viewpoint of Yellow Creek and the Paria River valley in the distance. Swamp Canyon: If we move away from the Bryce Amphitheater towards the south, we can find a series of more scattered viewpoints. The first one is Swamp Canyon with a view full of vegetation. Farview Point: From this viewpoint, you will see groups of striking colored Hoodoos at a great distance, as well as Willis Creek forming a narrow canyon that can be visited downstream. Piracy Point: From the previous viewpoint, we can walk to Piracy Point where there are good views to the north. Natural Bridge: From the next viewpoint we can see a sandstone bridge that frames a beautiful pine forest. 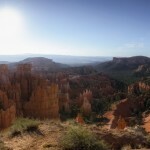 With no doubt, it is one of the most original and photogenic viewpoints in Bryce. Agua Canyon, Ponderosa Canyon, and Black Birch Canyon: These three lookouts are quite close together so they offer similar views: ravines and Hoodoos together with pine forests in the distance. Rainbow Point: The road ends at this viewpoint towards the east, offering an interesting view to the northeast. Yovimpa Point: A ten-minute walk through the forest to reach this last lookout that offers even more incredible views. 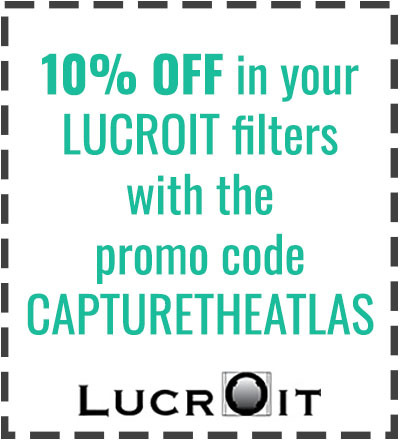 In this map, you will find the location of each of these viewpoints. 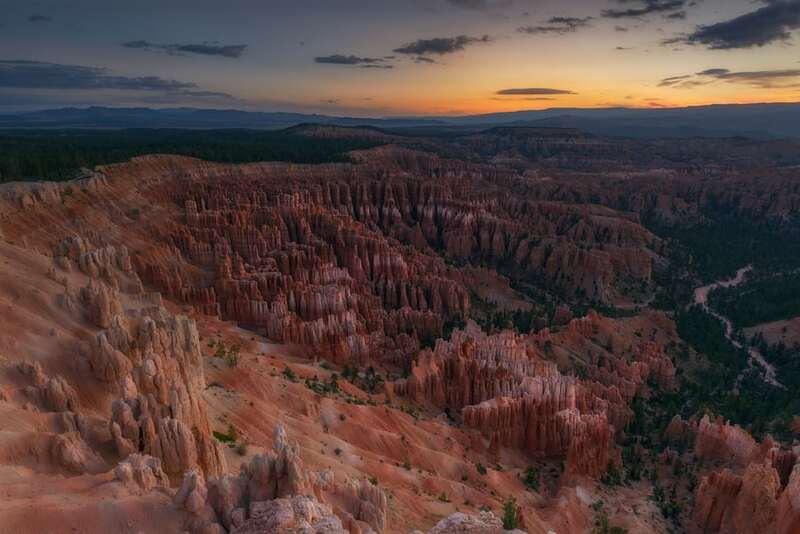 If you are only going to visit Bryce in one day, Sunrise Point, Sunset Point, and Inspiration Point are the three essential viewpoints that you should not miss in Bryce Canyon. Enjoy them especially at sunrise and sunset when the light starts to magically paint the Hoodoos in beautiful red and orange tones. There are many hikes in Bryce Canyon. You would need to spend at least a whole week if you want to do them all. 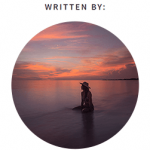 In this section, we tell you the main trails and day hikes to include in your itinerary. The Fairyland loop is the most popular of the strenuous hike. If you are a hiking lover with enough time, this trail is for you. 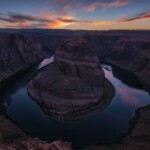 The hike starts from the Fairyland Point and overlaps with the Rim Trail, passing through Sunrise Point on the way. This trail has multiple elevation changes along the 8 miles until the end. It usually takes between 4 to 5 hours to complete the loop. In addition to different Hoodoos, we will discover a very peculiar rock formation known as “Tower Bridge” along with the trail. A large stone wall of hoodoos arranged in perfect lines, it reminds us of the London Bridge and Great Wall of China. 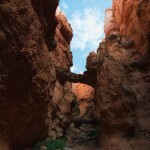 This trail starts at Sunrise Point and is considered one of the easiest within in Bryce Canyon. You will descend through the amphitheater surrounded by Hoodoos, and you will find the famous “Queen Victoria” rock formation on your way at some point. 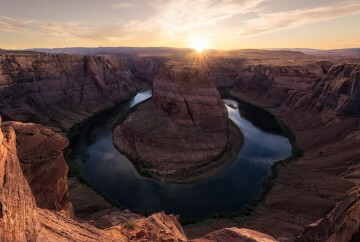 The hike is 1.5 miles one-way until you reach a four-way intersection where three other trails end (Navajo Loop on Wall Street, Navajo Loop on Two-bridges, and Peek-A-Boo). One of the most popular trails in Bryce Canyon National Park, the Navajo circuit trail starts at Sunset Point and takes us to the Bryce Amphitheater. This area is prone to rock fall from the cliffs, so be alert along your way. 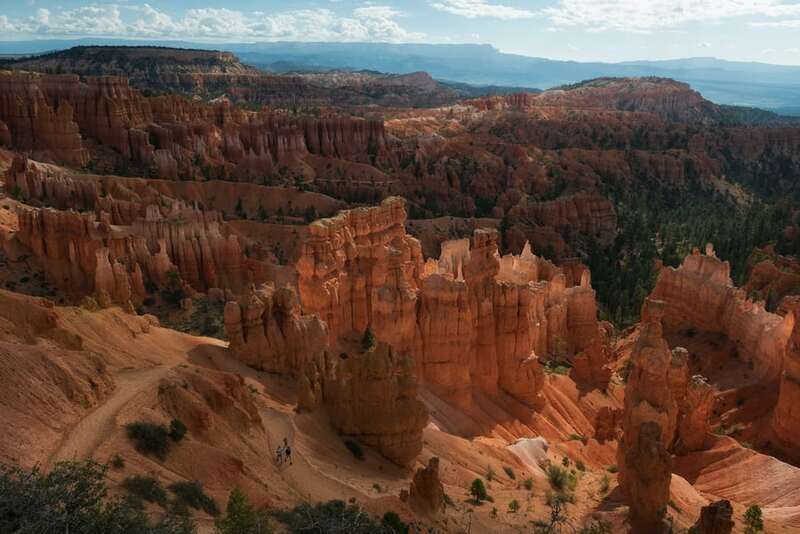 Along this 1.2-mile trail, we will find one of the most popular Hoodoos in Bryce Canyon, “Thor’s Hammer”, as well as the incredible “Two-bridges” formation. On the last section, we will go through what is known as the “Wall Street”, a steep bent path surrounded by tall hoodoos that takes us back to the starting point. 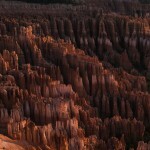 Nonetheless, Bryce Canyon’s best trek is the combination of Queens Garden and Navajo Loop. For this route, we will start at Sunset Point and hike a section of the Rim Trail until we reach Sunrise Point. From here, we will continue on the Queens Garden Trail passing through Queen Victoria, up to the intersection of four trails, where we will then take the Navajo Loop section that passes through Wall Street and end at Thor’s Hammer. 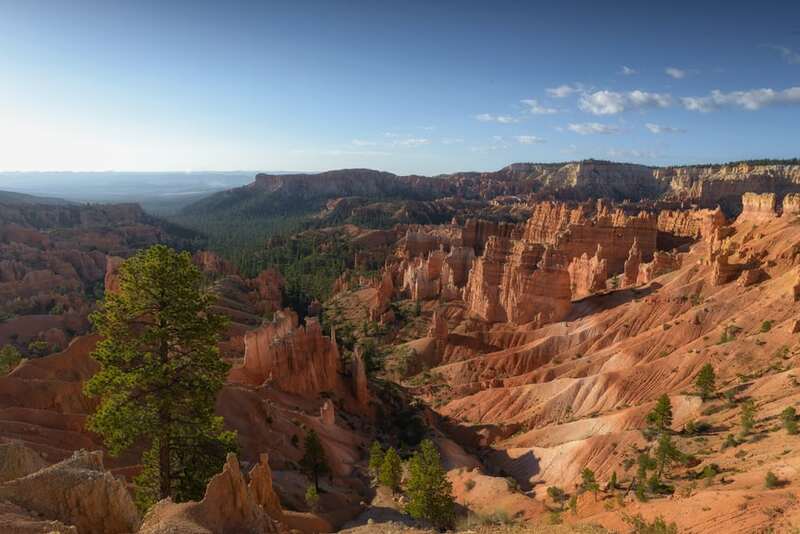 If you only have one day to visit Bryce Canyon and want to hit the most impressive landmarks of the park, we strongly recommend this combined trail. This trail is not so popular despite extraordinary views to be found of the Hoodoos, both near and far. In addition, it crosses some wooded areas which make this trail one of the most unique inside the park. 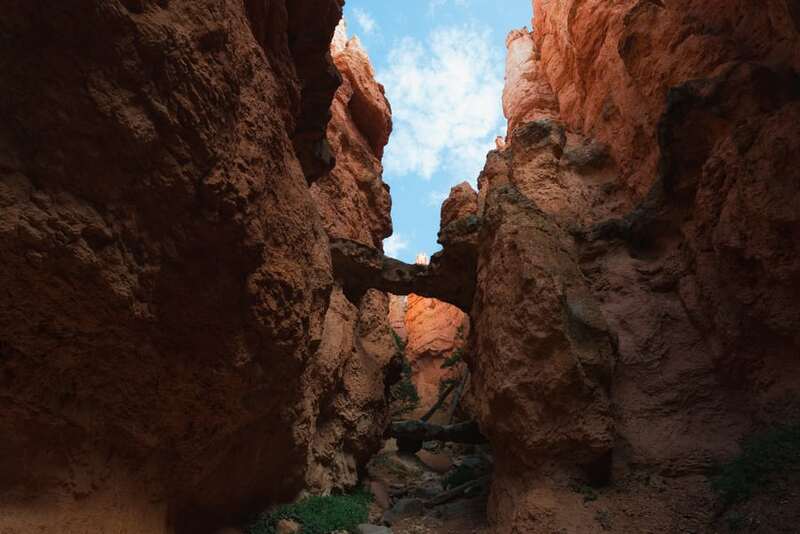 You can get to this trail from the intersection of four roads where Navajo Loop and Queens Garden Trail converges, or simply from Bryce Point. There are many slopes on the route, and the total distance of the trail is 5.5 miles (we should also consider the distances if we start this trail after the Navajo Trail or the Queens Garden Trail). 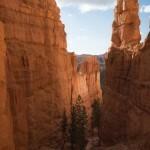 It is considered one of the most strenuous treks in Bryce Canyon National Park. 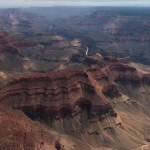 This trail follows the edge of the canyon with impressive views of the amphitheater. It goes from Fairyland Point to Bryce Point for 6.2 miles through Sunrise Point, Sunset Point, and Inspiration Point. The trail is very easy, especially between Sunrise Point and Sunset Point where the road is paved, making it accessible for wheelchairs. If you are going to visit Bryce for several days and prefer to go into the backcountry, Under the Rim Trail is a 21.7 miles hike between Bryce Point and Rainbow Point. There are 8 backcountry campsites along the way, plus three additional entries to the trail through Swamp Canyon, Whiteman Bench, and Agua Canyon. So, you can do just one section of the trail if you wish. If you decide to do this trek, you can find more information here. One of the busiest sections of Under the Rim Trail is the one between Bryce Point and the famous “Hat Shop”, where many mushroom-shaped Hoodoos congregate. 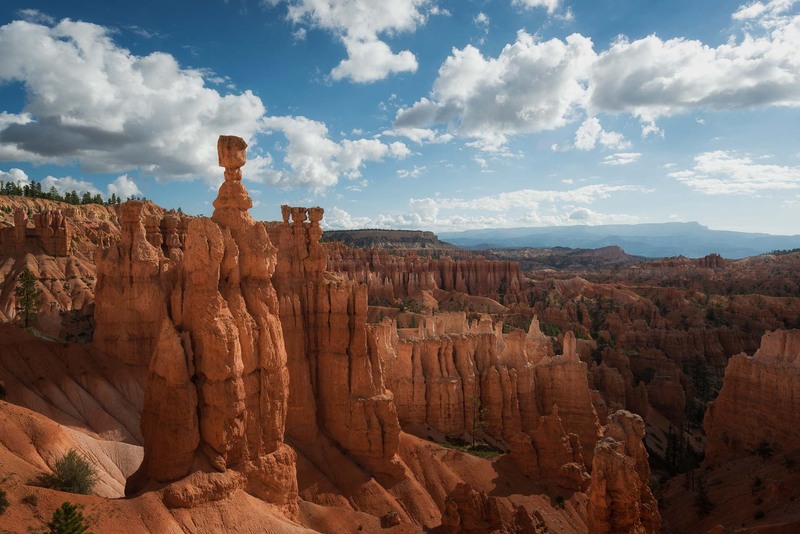 From Bryce Point, you can get down to this set of Hoodoos through a steep 2-mile section. The main difficulty is getting back up to Bryce Point, and this small section is considered moderate to difficult. Another trail you can hike over several days is the Riggs Spring Loop Trail that starts at Yovimpa Point and ends at Rainbow Point, with 4 backcountry campsites and several water springs on the way. Along with this 8.6-mile trail, the slopes are steep and is considered a highly difficult trail. Most of the trail runs through the forest with less impressive formations, but there are also interesting views. And, you will likely be by yourself, away from the masses gathered at the amphitheater. This short 1-mile trail starts at Rainbow Point where we would eventually reach the highest point of Bryce Canyon National Park at 9114 feet. There will be a mixed forest of White Spruce, Douglas Fir, and Blue spruce along the way where we can also find different species of birds, such as grouse, woodpeckers, and owls. After this section, the forest ends in several Bristlecone pines where we can enjoy a great panoramic view. On the way back, we can see part of the Promontory, an isolated summit with rock formations similar to those found in the amphitheater. 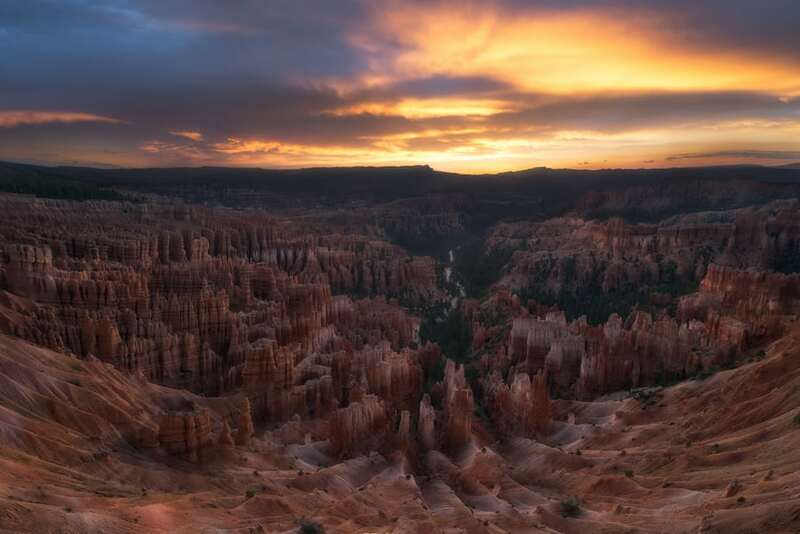 After all the information about the best things to do in Bryce, we will give you some tips to make the most of your visit to Bryce Canyon, which is fundamental especially if you visit Bryce in one day. Parking in Bryce Canyon National Park is very limited, so to stay off traffic congestion, the National Parks Service provide free bus shuttles. Although using Bryce shuttles is not mandatory since you can always enter the park with your own car, it is recommended to use them so no more parking areas would be built, as it deteriorating Bryce Canyon’s natural environment. The Bryce Canyon Shuttle picks up passengers outside the park and stops at the main points of interest around the Bryce Amphitheater, such as the visitor center, Bryce Canyon Lodge (the only hotel in the park), as well as these viewpoints: Sunset Point, Sunrise Point, Inspiration Point, and Bryce Point. Buses depart approximately every 15 minutes, making it very convenient, especially considering that only 1 in every 4 cars that enter the park manage to find a parking spot during the high season. Also, if you want to explore the viewpoints south of the amphitheater by public transit, you can sign up for the free guided tour that goes to Rainbow Point. This guided tour is offered twice a day (at 9:00 a.m. and 1:30 p.m.) and lasts for 3.5 hours. The visit can be booked up to 7 days in advance by calling 435-834-5290 or directly at the Shuttle office. If there are any spots available at the time of departure, they will be filled in order of guest arrival. If you don’t want to take the full guided tour and only want to use the shuttle to get off at one of the viewpoints, you just have to aware of the scheduled pick-up times and places. April 13 – May 17 8:00 A.M. to 6:00 P.M.
May 18 – September 30 8:00 A.M. to 8:00 P.M.
October 1 – October 22 8:00 A.M. to 6:00 P.M.
Also, if you are doing one of the long hikes which involve camping in the backcountry, you will need a permit that can be collected up to one hour before the visitor center closes. Summer May – September 8:00 a.m. – 8:00 p.m.
Fall October 8:00 a.m. – 6:00 p.m.
Winter November – March 8:00 a.m. – 4:30 p.m.
Spring April 8:00 a.m. – 6:00 p.m. The bus service that runs through Bryce is free. However, whether you entering by bus or vehicle, you will still have to pay a park entrance fee. The entrance fee to Bryce is $20 per person or $35 per vehicle up to a maximum of 5 people. However, if you have purchased the America the Beautiful National Parks annual pass for $80, access to this park and many others will be included. The only thing not include this annual pass is the backcountry camping permit, which is an additional $5. The weather in Bryce is warm in the summer and very cold during the winter with frequent snowfalls. In fact, it is common to find roads and trails closed during the winter and sometimes into spring. The best time to visit Bryce is from May to October. However, if you can choose when to visit, I would recommend between June and September, when temperatures are warmer and fewer tourists are present, best for visiting any national park in the USA. There is no minimum recommended timeframe for a visit to Bryce Canyon. Even in just one morning you can see the most interesting areas and admire the incredible rock formations from the viewpoints. However, I would suggest spending at least 1 full day in Bryce Canyon if you would like to hike the main trails. It is also important to consider the total length of your trip. For example, if you are going to take a 10-day West Coast USA trip, plan for 24 hours in Bryce; but if your trip along the Western USA is more than 20 days, then plan for two or even three days in Bryce. At this point I’m sure you have already made up your mind and decided to visit Bryce for its unique landscapes. 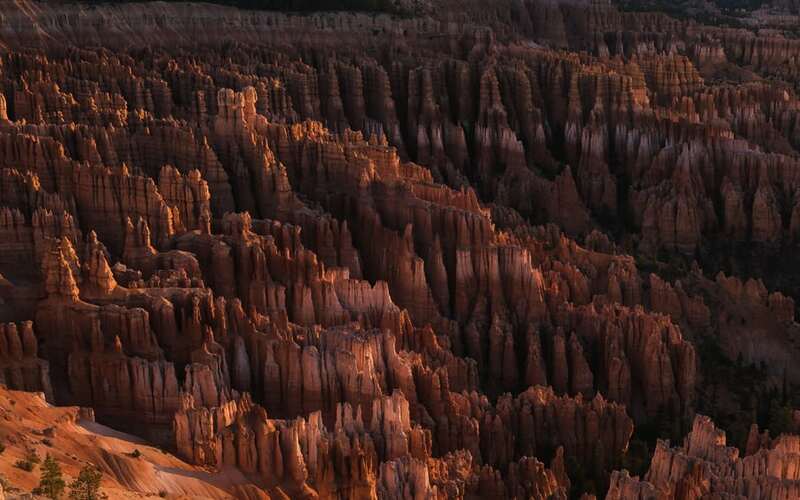 Nonetheless, you might be wondering how Bryce Canyon was formed and what the Hoodoos are. Bryce Canyon was formed after erosion caused by wind, water, and ice. 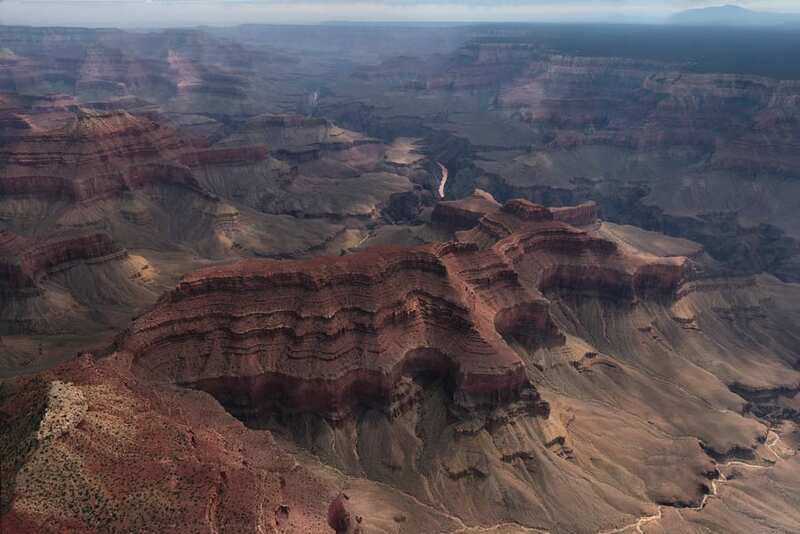 It was not erosion coming from a central water source, as it happens in other canyons like the Grand Canyon. In fact, there were hundreds of streams carving through different amphitheaters where the Hoodoos are located, better known as fairy chimneys. 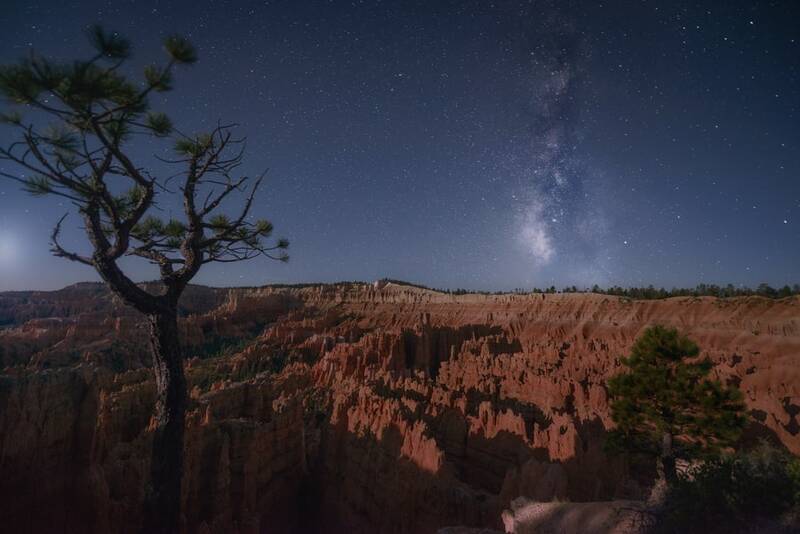 Besides the famous Hoodoos, another unique and often overlooked feature of Bryce Canyon National Park is its night sky. Bryce is very far from cities and other populated areas, so there is no light pollution. 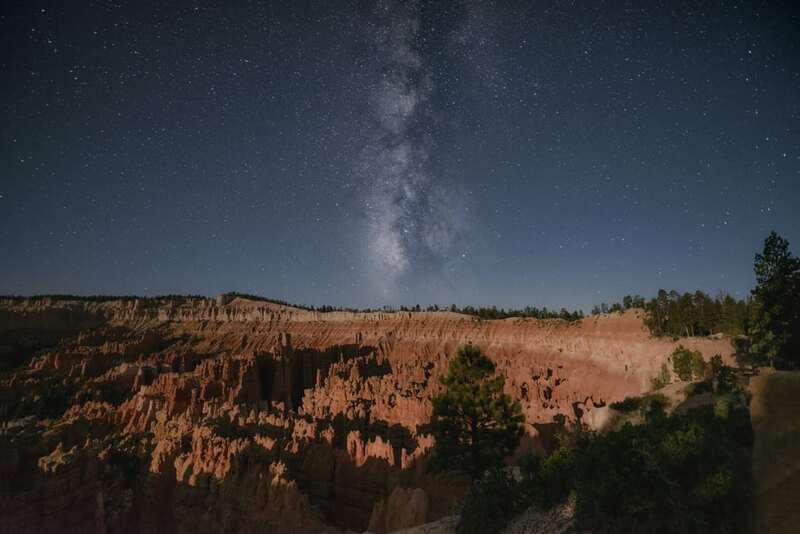 In addition, being that it’s located at high elevation, Bryce Canyon National Park is one of the best places to stargaze in the west coast and throughout the United States. Our visit took place coincidently at the same time as the Perseid meteor shower, a unique opportunity to enjoy the night skies of Bryce in all its glory. 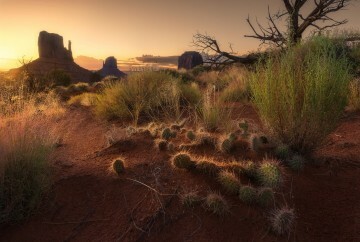 Though a unique place, it is the least visited national park in Utah, since Zion National Park and the Grand Canyon are more accessible. 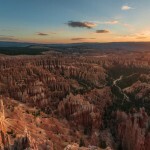 However, there is no doubt that visiting Bryce Canyon is absolutely worth it. Bryce Canyon Lodge: This is the only hotel in Bryce Canyon National Park, so it is recommended to book it approximately one year in advance. It offers 114 rooms, but being just one step away from Bryce Amphitheater means it is always full in high season and almost impossible to book if you do not plan your trip well in advance. North Campground: This camp is located in front of the Bryce Visitor Center, in the northern area of the national park. There is availability for both tents and RVs. You can only book a few spots in advance. The others are filled in a first-come first-served basis. The price is $ 20 per tent or $ 30 per RV. Sunset Campground: This camp is located near Sunset Point, and like the previous one, it is equipped both for tents and RVs. It is smaller and usually filled as it is even closer to the main points of interest. However, unlike the North Campground, there are no showers here. Backcountry Campgrounds: At the end of this article you will find a map with all Backcountry Campgrounds in Bryce marked in black. They are mainly located near the “Under-the-Rim” Trail and Riggs Spring Loop. Before starting your multi-day hike in Bryce, remember that you need a backcountry camping permit is issued by the visitor center for $5. You can find all the information here. 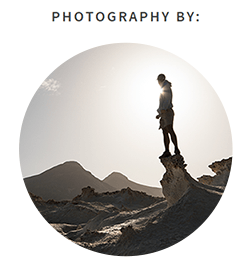 As in every article, we created a small gallery with our best photos of Bryce. We hope you can find some inspiration through them and that they encourage you to explore and take your own Bryce photos trip. Here you can check the Bryce Canyon National Park map, with all viewpoints, hikes and trails, best accommodation and campsites in Bryce and the Hoodoos that you cannot miss during your visit to Bryce. Ready? 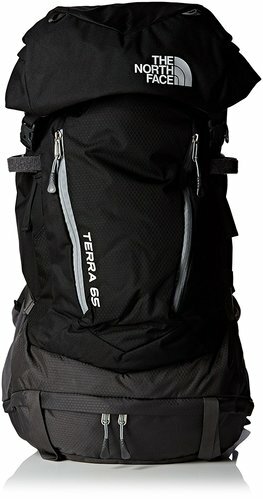 You have everything you need to start your trip. 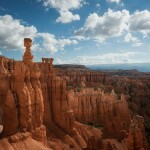 SEE YOU IN THE NEXT ARTICLE AND DO NOT HESITATE TO LEAVE US A COMMENT IF YOU NEED MORE INFORMATION ABOUT BRYCE CANYON. Thank you for such a detailed explanation on the Bryce park. 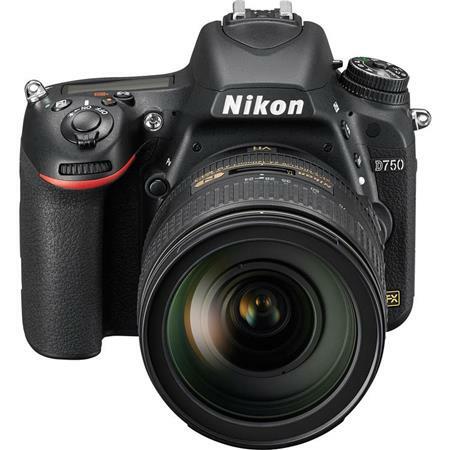 What places do you suggest for an astro photo in the park and around what time do you suggest? Is it safe (wild animals) to stay by yourself during the night if you want to take pictures? 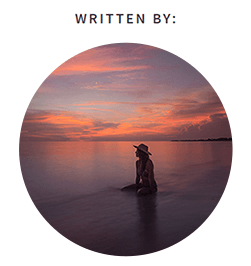 Also if I have to choose one spot for the sunset – do you recommend the sunset point or the inspiration point? 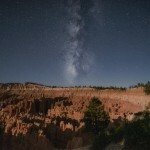 For astro any area of Bryce is incredible and full of starry dark skies. I would suggest the area around Thors hammer since it is not too far from the parking lot and you have many compositions to play with. I wouldn’t worry about safety as regards wild animals. The only harmful animal is the mountain lion which 99% of the times run away from human presence. If you are more than 2 adults there shouldn’t be anything to fret about.